1. 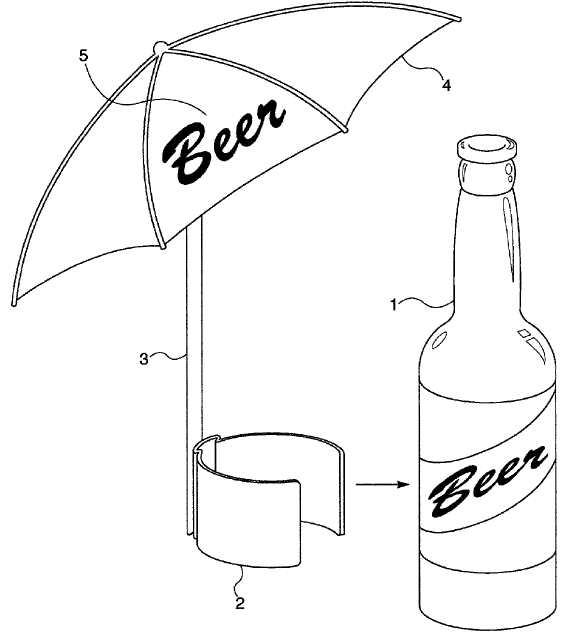 A combined beverage container and shading apparatus, comprising: a beverage container, for containing a beverage; a means for removably attaching the apparatus to the beverage container; a shaft, coupled to the means for removably attaching the apparatus, and extending vertically with respect to the beverage container; an umbrella, coupled to the shaft at a point above the means for removably attaching, so as to shade the beverage container, wherein the means for removably attaching comprises a clip provided to attach to the beverage container by means of spring action and friction. 2. The apparatus of claim 1, wherein the umbrella comprises a small umbrella approximately five to seven inches in diameter. 3. The apparatus of claim 1, wherein the umbrella comprises a small paper-like umbrella with balsa framing. U.S. Pat. No. 6,360,693: Animal toy. JW Note: Many thanks to Brad Bower at Duke University for tipping me off to this one. Meet registered patent attorney Jake Ward and his staff at Ward Law Office LLC. Jake works alongside his wife and Business Manager, Kristi; Office Manager, Jenn; and Associate Attorney, AJ, in their office on the second floor of the Laird Arcade building, in downtown Tiffin. The patent and trademark law firm opened their doors this January, although Jake has been practicing patent law for over 12 years. Quite simply, “We help inventors. That’s our job,” Jake explains. They have opened over fifty new cases, with more than ten new clients, since January. The firm represents independent inventors and businesses locally, and across the United States. Local companies include Cooper Tire, Ballreich’s, Ralph’s Joy of Living, and Creative Plastic Concepts. The firm also helps many foreign companies, in countries such as the UK, Brazil, China, Israel, and Canada.